Copper Shield Hard provides full season antifouling protection against barnacles, algae and hydroids in salt and fresh water on boat bottoms only. Its modified epoxy base renders a smooth finish with durability and abrasion resistance. 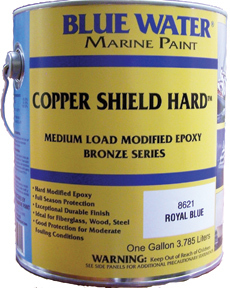 Copper Shield Hard releases biocide by the exposure of paint film to the water. Copper Shield Hard has universal application over all types of properly prepared bottom paints (except aluminum). For use on fast fiberglass boats, as well as wood and steel hulls.